Product #46603 | SKU 11870 | 0.0 (no ratings yet) Thanks for your rating! 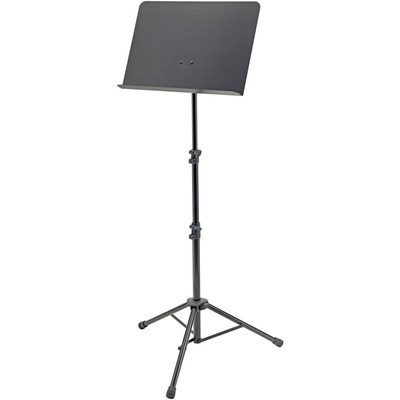 Powder coated aluminum music stand with a steel plate. Connecting parts made out of durable plastic. The music desk can be removed and attached easily with its user friendly and practical quick release mechanism. A large wing-nut makes it easy to adjust the angle. The music desk can be adjusted variably by clamping sleeves that protect the surface. 2 piece rod combination.